Abba Giyorgis (d. 1426) was an Ethiopian monk who was chaplain to Emperor Dawit I (r. 1380-1412). According to “The Miracle of Saint Uriel the Archangel,” the English translation of which takes up pp. 9-13 of this document,* he was descended from the son of King Solomon whom Solomon sent to live among the Ethiopians. Like many great men, Abba Giyorgis was born to parents who at first seemed infertile, but through constant prayer and supplication, their infertility was cured. The second miracle, besides his birth, was when Abba Giyorgis was taught by the Archangel Uriel the alphabet. He had spent 7 years at Hayq, “the Paradise of the East,” unable to learn his letters. The Archangel, who had previously granted his parents the gift of this son, granted to Giyorgis the ability to read and write. the “Arganona Wedase” (“Hymns of Praise”), the “Wedase Masqal” (“Praises of the Cross”), the “Matshafa Sebhat” (“Book of Thanks”), also called the “Matshafa Berhan” (“Book of Light”), the “Matshafa Mestir” (“Book of Mysteries”), which is a compilation of doctrines, completed two years before his death, and the “Matshafa Saatat” (“Book of Hymns”). He also became abbot of the monastery of Dabro Damo as well as chaplain to Emperor Dawit, as mentioned above. Like many men of active mind, he got himself into controversy and, thence, into prison. He got out of prison as a result of a new emperor, Tewodros, who was one of his former pupils. I became aware of Abba Giyorgis because of his role in the daily office of the Ethiopian Orthodox Church. ** The last book in the list of his writings, the “Matshafa Saatat” is the book of the daily office. 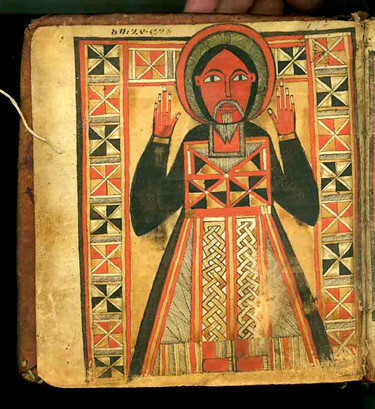 Sa’atat is the Ethiopian hours or horologion. This . . . sa’atat, apparently the only one still in common use, comprises nocturns and an eleventh and twelfth hour. Nocturns and vespers or the eleventh hour are little more than a series of four Scripture lessons, with a responsorial pslam before the last, always a gospel, at nocturns. This lection unit is enclosed in a framework of opening prayers and concluding intercessions, hymns, orations, canticles, etc. The twelfth hour is a devotional office in praise of Mary. I hope this brief telling about Abba Giyorgis has been enlightening. For me, it is a reminder of the international character of Christianity, that is not just Catholics, Protestants, and the Eastern Orthodox, but that there are Egyptians, Ethiopians, Iraqis, Indians, Iranians, and others who are part of the historic line of the Christian faith founded upon the teachings of the Apostles. And the traditions of the Church, such as the praying of the daily office, are part of that historic, international tradition. *If you know Amharic, the English translation is, of course, unnecessary. **In Robert Taft, The Liturgy of the Hours in East and West (Liturgical Press, 1986), p. 269.